Nokia recently made the availability of its all new Nokia X5-01 handset in Singapore market.As you could see the new Nokia X5-01 mobile phone has a square-shaped design and includes a slide-out QWERTY keyboard helps in instant and easier messaging. New Nokia X5-01 equips a 2.36-inch display of QVGA resolution and a 5-megapixel camera with LED flash and 4x digital zoom for taking quality images.The Nokia X5-01 QWERTY slider Handset runs on Symbian S60 OS and comes with Music unlimited audio downloads.The Nokia X5-01 mobile phone also features shuffle by just rotating the handset. 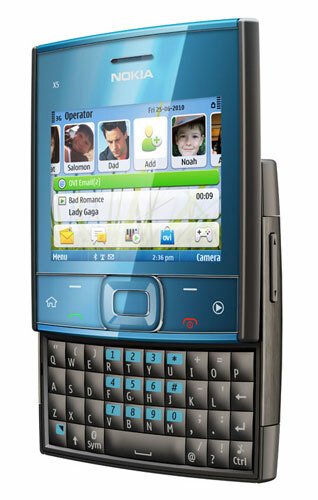 The all new Nokia X5-01 mobile phone comes included with a 200MB of internal memory and is provided with a microSD card slot that can support up to 32GB Card.The handset comes packed with a 2GB card.The Nokia X5-01 handset comes integrated with social network sites including Facebook, Twitter, Hi5, MySpace and YouTube.Other features of Nokia X5-01 mobile phone includes Wi-Fi, GPRS, EDGE, Bluetooth 2.1, microUSB and 3.5mm audio jack.The handset weighs 129.0 g and its dimensions are 74.3 x 66.4 x 16.8 mm. Another features of the Nokia X5-01 mobile phone is by just shaking one could possibly hear how many unread messages that he/she has.Though the Singaporean launch is confirmed the exact launch date is not revealed yet. 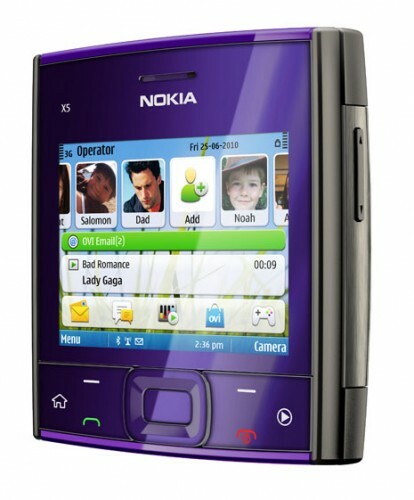 The new Nokia X5-01 mobile handset is expected to be available for sale with a price tag around €160 ($194). 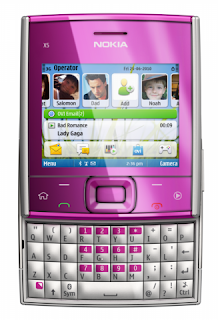 Tags:-Mobile Phones, nokia, QWERTY Keyboard, Nokia X5-01 mobile phone features, Nokia X5-01 mobile phone specifications, Nokia X5-01 mobile phone details, Nokia X5-01 mobile phone release, Nokia X5-01 mobile phone availability, Nokia X5-01 mobile phone price tag, Nokia X5-01 mobile phone images, Nokia X5-01 mobile phone price details, Nokia X5-01 mobile phone price, Nokia X5-01 mobile phone specs, Nokia X5-01 mobile phone colors, Nokia X5-01 mobile phone shades, Nokia X5-01 mobile phone.